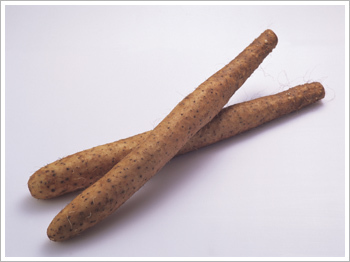 The nagaimo (長芋、ながいも), or Dioscorea opposita, is also known as the Chinese yam or Korean yam. The first kanji is “long”; the second is best read as “yam”. Yams long predated potatoes in Japanese cuisine. The defining feature of the nagaimo is that, unlike other yams, it’s safe to eat nagaimo raw. That means you can grate nagaimo and use it in food almost instantly. Note that whole tubers are soaked in a vinegar-water solution to neutralize an irritant in the outer skin. In grated form, it is called tororo. Used as a topping for tororo udon. Used for “authentic” okonomiyaki (home made style pancakes). The root is also used in traditional Chinese medicine (“Shanyao root”). Note that high heat cooking will lower the nutritional value. This entry was posted in Food, Japan, Japanese and tagged cuisine, food, Japan, Japanese, nagaimo, okonomiyaki, soba, udon. Bookmark the permalink.